Fingolimod is unable to slow disability progression or brain volume loss in patients with primary progressive multiple sclerosis (MS), show the findings of the INFORMS study. The findings, which are published in The Lancet, are consistent with the failure of other drugs that are effective against relapsing–remitting MS to influence the course of the progressive form. However, success for other medications – notably biotin and ocrelizumab – has recently been reported in patients with primary progressive MS. The lack of effect on clinical outcomes in the INFORMS study came despite fingolimod producing around a 75% reduction in the number of gadolinium-enhancing and new T2 lesions on brain magnetic resonance imaging over the 36 months of the trial. “These results are consistent with those of previous studies that showed disconnect between acute inflammatory lesions and clinical progression or brain atrophy”, say Benjamin Segal (University of Michigan, Ann Arbor, USA) and Olaf Stüve (University of Texas Southwestern Medical Center at Dallas, USA) in an accompanying commentary. INFORMS investigator Fred Lublin (Icahn School of Medicine at Mount Sinai, New York, USA) and team used a composite primary endpoint based on an increase in Expanded Disability Status Scale (0.5 or 1.0 points for baseline scores of ≤5.0 or ≥5.5, respectively) and a 20% increase in the 25-foot Timed-Walk Test or Nine-Hole Peg Test time. “This composite endpoint yielded more progression events than its components”, says the team. 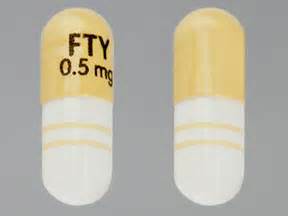 By this measure, 3-month confirmed disability progression occurred in 69% of the 336 patients randomly assigned to receive fingolimod 0.5 mg/day and 69% of the 487 patients assigned to the placebo group. There were also no differences for the individual components of the composite endpoint and for 6-month confirmed disability progression. And brain volume was unaffected by treatment; it declined by 1.49% in the fingolimod group and 1.53% in the placebo group. “The results of INFORMS suggest that anti-inflammatory strategies applied at present in relapse-onset multiple sclerosis are unlikely to be beneficial in primary progressive multiple sclerosis, and that novel approaches might be needed to treat patients with primary progressive multiple sclerosis”, conclude the researchers.